The 10.1 inch Android Table which Sony announced at MWC 2012 has been released for global sales through Sony's retail stores, operator partners and online channels. 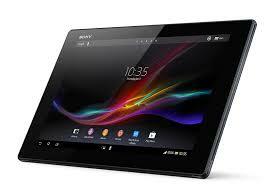 The Xperia Z Tablet is just 6.9 mm in depth which makes it the slimmest tablet in this category. It runs on Android 4.1 Jelly Bean and is powered by a Qualcomm Snapdragon S4 Pro asynchronous quad-core processor. Another interesting fact is that Xperia Tablet Z is IP55 and IP57-certified waterproof (IP55 & IP57), which means it can be immersed in up to three feet of water for up to 30 minutes. If you remember the Xperia Z phone is IP55 certified and Xperia ZR is IP57 certified. The Xperia Tablet Z is powered by Mobile BRAVIA Engine 2, which delivers enhanced colour reproduction for a brilliant TV-like viewing experience. And if you have a Bravia TV in your house, you just have to connect them to get the best out of it. The 8 megapixel rear camera features an Exmor R for Mobile image sensor and the 2 megapixel front-facing camera is great for self-shots and video chatting. The tablet comes with Sony's S-Force Front Surround 3D, while Sony's Clear Audio+ mode and the two built-in speakers help the tablet deliver amazing sound at any angle. The Xperia Tablet Z also offers a microSD card slot for up to 64GB of expandable storage. It includes Sony's Near Field Communication (NFC) One-Touch functions, which allow users to transfer content among compatible devices, including audio, video and images. The Xperia Tablet Z weighs 495 grams and is available in black or white colours in 4G or Wi-Fi versions. The tablet's Universal IR Remote allows users to control their Sony TVs and other Sony devices as well as products from other manufacturers directly within the tablet. To top it off, online portal Flipkart.com has started taking pre-orders for the Tablet at Rs.44990.00. However the price is bit to steep for my liking as converting the USD price into INR for the Tablet comes to around Rs.38000.00. 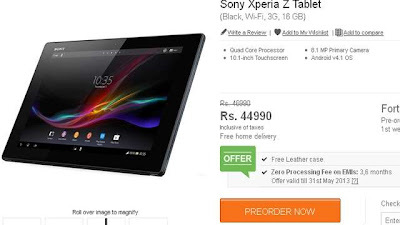 Sony on its part has confirmed that India has not yet been made a part of the global launch and the tablet would be cheaper by arround Rs.5000.00, once Sony launches it in India. We have among us those kind of dire addicts, whose hands just itch to get the device may well be happy that the device is available in India. To others I advise to hold the purchase for a few weeks. Please write in your comments. I love how they moved the nav buttons and notifications back to where they were before 4.2: to the left and right sides of the bottom bar. It makes so much more sense than having nav be centered on the bottom and having notifications on the top on a 10inch tablet.